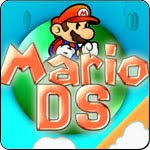 Mario DS is a another fangame creation. Collect the coins, eat mushrooms to beat the game. Game don't contains Ads because this is a fangame and the most of the graphics was made by fans.